Obituary – Klein, Mary Louise (Steichen) « Perry High School Alumni Association, Inc. Band ’43-’46, Glee Club ’44-’45, Library Staff ’45-’46. ﻿Mary Louise Klein, 62, 701 Ivanhoe street, died at 4:10 a.m. Sunday at Enid Regional hospital where she was admitted at 12:30 a.m. Sunday. Wake service will be at 7 p.m. Tuesday at Brown Funeral home chapel. Funeral mass will be at 10:30 a.m. Wednesday at St. Rose of Lima Catholic church. Rev. Kevin Devlin will officiate. Burial will be at St. Rose of Lima Catholic cemetery. Memorials may be made to the Catholic Foundation of Oklahoma for education scholarships. Mrs. Klein was born at Perry, Dec. 25, 1928, the daughter of John M. and Maude Steichen. She attended Rose Hill school and was a graduate of Perry high school. She and George Klein were married Nov. 11, 1950, at Perry. A former teacher in rural schools, Mrs. Klein also had been a former employee of Noble County Abstract Co. She was a member of St. Rose of Lima Catholic church and had served as church organist for 42 years. She was a member of the Altar Society, Sunny View homemakers group, American Legion Auxiliary and Alpha Chi Study club. Mrs. Klein was a past president of the Perry Band Boosters, was a Bluebird and Camp Fire leader for eight years, had been recognized by Boy Scouts of America for having served years as a Cub Scout and Boy Scout leader, and was named a Woman of the Month in 1978 by The Perry Daily Journal. She had been recipient of the lifetime achievement award from the American Association of Meat Processors. 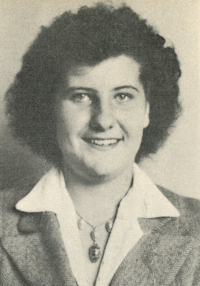 In addition to her husband, of the home, survivors include one daughter, Janet Netherton, Perry; four sons, John Klein and Bob Klein, both of Tulsa; Bill Klein, Perry, and Patrick Klein, Enid; three grandchildren and three brothers, John H. Steichen, Perry, Joe Steichen, Ponca City, and Bob Steichen, Tonkawa.